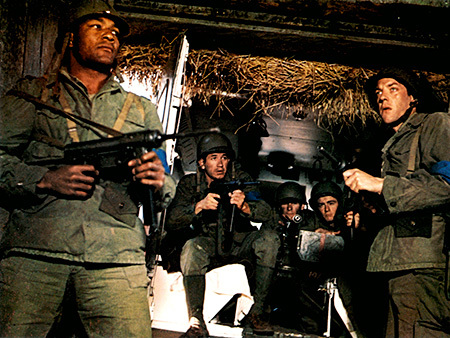 "The Dirty Dozen" (1967) is my favorite World War II movie, directed by Robert Aldrich from a book by E.M. Nathanson. It has it all: drama, fireworks, explosions, tough guys, top performances, even some sly comedy thrown in. If the film has any drawback at all, it is that the "mission" passes too quickly and it has to end at some point. This is the ultimate "tough guy" movie and it gets my highest rating. Condemned men are chosen by a tough Major to lead a suicidal assault on a German headquarters in exchange for the promise of freedom if they survive. Who lives and who dies? The thing about movie tough guys is that they become completely dull if they don't have an underlying humility and display some recognition that all the hurdles they have to jump over are inherently absurd. A movie tough guy without a sense of irony or humor just doesn't make it. He also has to display somewhat realistic vulnerability that may or may not get him through. Not too many movie tough guys pass these tests. 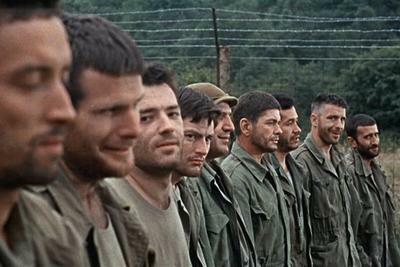 John Cassavetes showing how to steal a scene in "The Dirty Dozen." "The Dirty Dozen" passes these tests, and more. The opening is classic, with the "heroes" shown to be condemned men, outcasts of society. But tough guys exist outside society, so being behind bars is not a detriment, but rather only adds spice to their characters. The locations are extraordinary - these were the days before CGI, so they actually went places and acted at them. "The Dirty Dozen" is notorious for one thing: the producers actually built a French chateau for the film - and then blew it up. That injects a note of realism into the film that many more recent films lack. 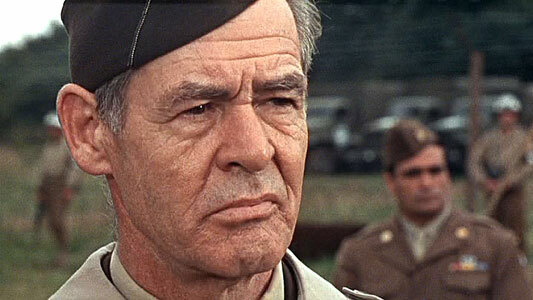 Robert Ryan plays the heavy in "The Dirty Dozen,"; he was an actual World War II hero. A key aspect of a tough guy is that the real obstacles he faces are not those of the "enemy," because the enemy ultimately will be confronted and overcome. The obstacles are imposed by those around him which can prevent the tough guy from even coming to grips with the "enemy." Inevitably, someone doesn't believe they are up to the task, or wrongly thinks they don't deserve it, or don't have the right character to be fit for the job. This film abounds with those types of issues. Capturing the "enemy" headquarters in "The Dirty Dozen." How often do you see Jim Brown, Donald Sutherland and Charles Bronson in the same frame outside of this film? Not too often. So, here we have the perfect tough guy movie. 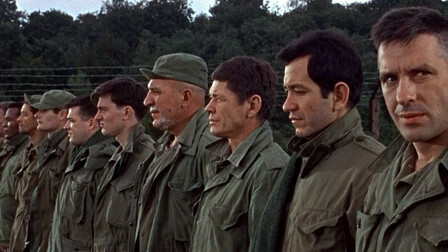 A group of condemned men, forced together for a possible suicide mission, looked down upon by the rest of the military. To even get to the suicide mission, they must overcome their own comrades in the military bureaucracy and the envy, spitefulness and obstruction of the "allies" around them. A tough guy has a job to do, and he does it, without pettiness. Those who display pettiness and get in his way, well, they are simply amusing and must be overcome. 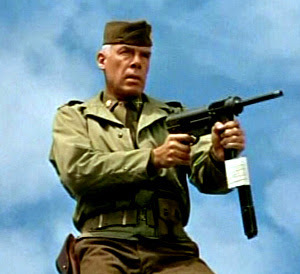 Lee Marvin just takes over "The Dirty Dozen." The cast here is brilliant, a collection of all-stars. A similar group could not possibly be assembled today, many of these actors having come up the hard way. Several actually served in World War II and saw real combat. Career performances are drawn from Jim Brown (who retired from the NFL because of his role here), Telly Savalas (who actually acts out a character and not himself as in, say, "Kojak" for a change), Lee Marvin (a former Marine who helped invade 21 islands), Donald Sutherland, Richard Jaeckel (USN 1944-48), Ernest Borgnine (USN 1935-45), Robert Ryan (former US Marine and boxing champion), and John Cassavetes. 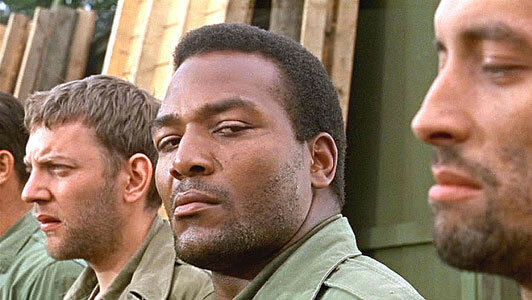 Jim Brown quit NFL football to complete "The Dirty Dozen." It was the NFL's loss and Hollywood's gain. Obviously, this tale is pure fiction. Lee Marvin, in fact, considered "The Dirty Dozen" a bit of a joke. He, Borgnine, Robert Webber (US Marine at Okinawa), and several others in the cast had every right to, having actually served in World War II. Marvin served in the Pacific Theater as a grunt and participated in several contested beach landings. Lee Marvin really is the real deal, not just pretending to be the real deal, so his opinion carries a lot of weight... but I still love this film. The epic conclusion to an epic war film. 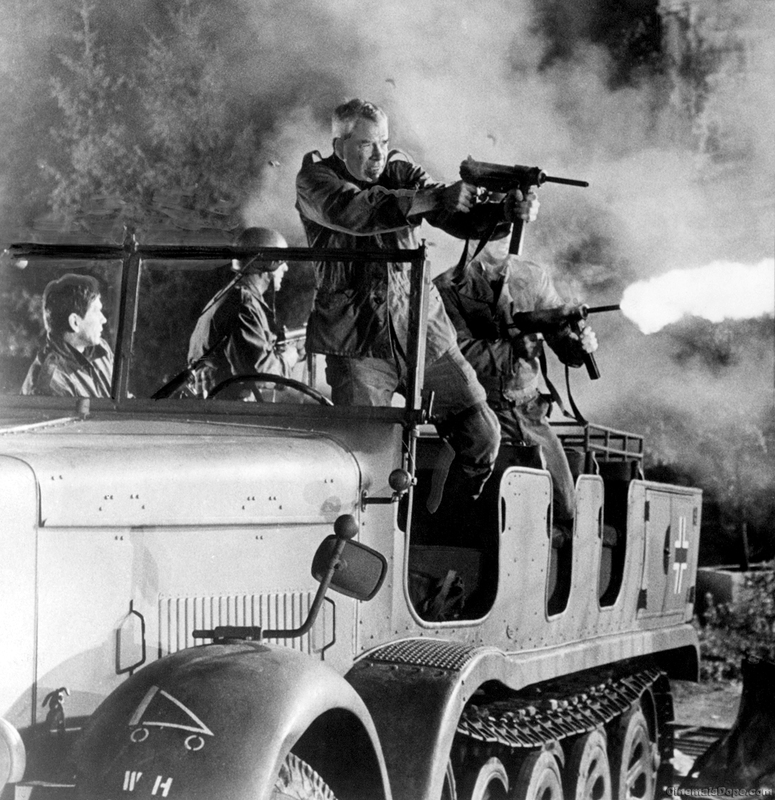 THIS is how you end a World War II film like "The Dirty Dozen." But there is underlying realism to it - there actually were "punishment" units during World War II among both the Germans and Allies, and there were paratrooper raids on the eve of the Normandy invasion, and an actual squad called "The Filthy Thirteen" who did demolitions on D-Day. There is just enough reality to overcome the unrealistic aspects (such as Germans in Occupied France who apparently never heard of a blackout). 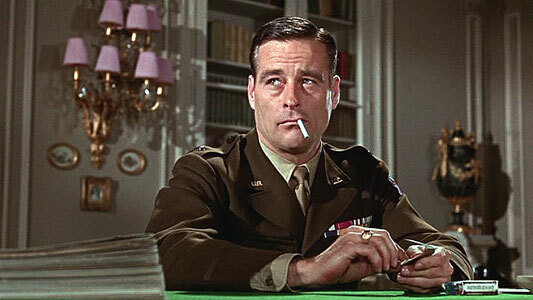 The supporting characters in "The Dirty Dozen" are pitch-perfect - Robert Webber was another real-life war hero. The most interesting aspects of this film to me are its hard-edged humor and its structure. A favorite scene is one in which Donald Sutherland, as one of the Dozen, impersonates a General in order to get his unit out of a tight fix. "So, where are you from?" Blah blah. "Never heard of it." Classic! That scene led to Sutherland's casting in "MASH," which led to Sutherland becoming a star. The black humor is essential, and it the lack of it that keeps so many other war films from greatness. And the humor never gets out of hand or loses it punch, as in, say, "MASH." 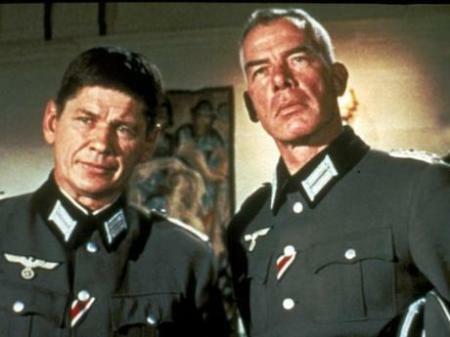 Lee Marvin and Charles Bronson infiltrating the enemy chateau in "The Dirty Dozen." I'm sure there was a lot of joking on set about how realistically they could portray Wehrmacht officers. The structure is important because the majority of the film concerns the unit's preparation for its mission. That is precisely right. Real soldiers spend huge amounts of time in preparation, and the actual fight passes in an instant. Preparation is the key to everything in life. I applaud this film for having the preparation phase as the longest and most interesting section, though of course the climactic assault is the exciting part. 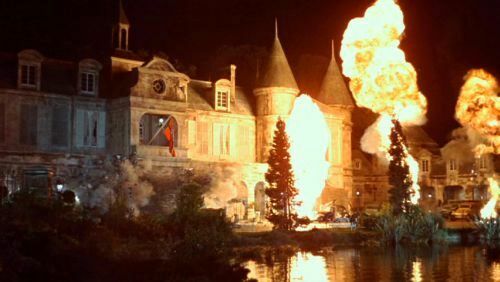 They built a fantastic chateau at great expense for "The Dirty Dozen" - and then blew it up. When the château, the ultimate target, is finally spied over a ridge, we get a momentary thrill, underlined by the musical score - but then it is down to business - war business. And here, unlike in, say, "Where Eagles Dare," the Germans can actually shoot straight when they have to. The chateau, incidentally, was built for the film, one of the largest sets ever constructed. 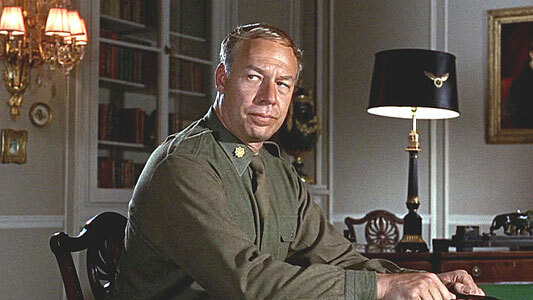 "The Dirty Dozen" is one of Oscar-winner George Kennedy's most underrated performances. Several sequels were made which were not very interesting, though they had their moments. It was the deep cast that made this film, one of the best casts in war-movie history. A contemporary documentary on the making of the film that is included on the DVD is highly amusing because it juxtaposes movie tough guys on real-life 1960s London, and the result is pure unintentional comedy ("Here is Lee Marvin at a local motorcycle race staring into space. What deep thoughts is he thinking?"). Telly Savalas almost steals "The Dirty Dozen" as a demented GI, but he has a lot of competition. I could go on and on with praise for "The Dirty Dozen." It is one of the most under-rated films of all time. It is not "supposed" to be a good film, so nobody treats it that way, but it practically defines the whole "Rambo/Schwarzenegger" genre two decades in advance. 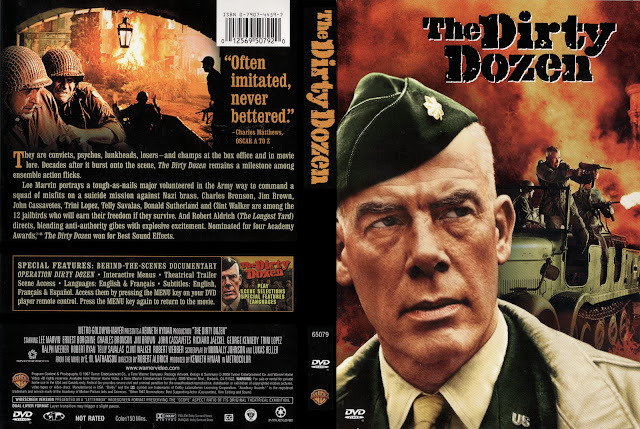 If you like war films or tough guy films or just plain good acting, you must see "The Dirty Dozen." It is one of those films that rewards repeated viewings, too. Below is the original trailer from 1967. Embrace of the Vampire (1995) - Alyssa Milano Surprises!